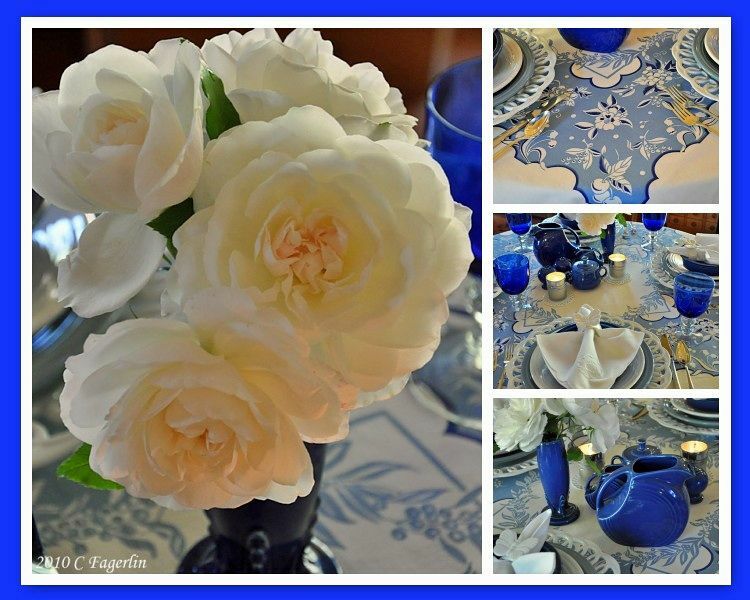 I've put together a classic blue and white tablescape just for all the BLUE lovers. 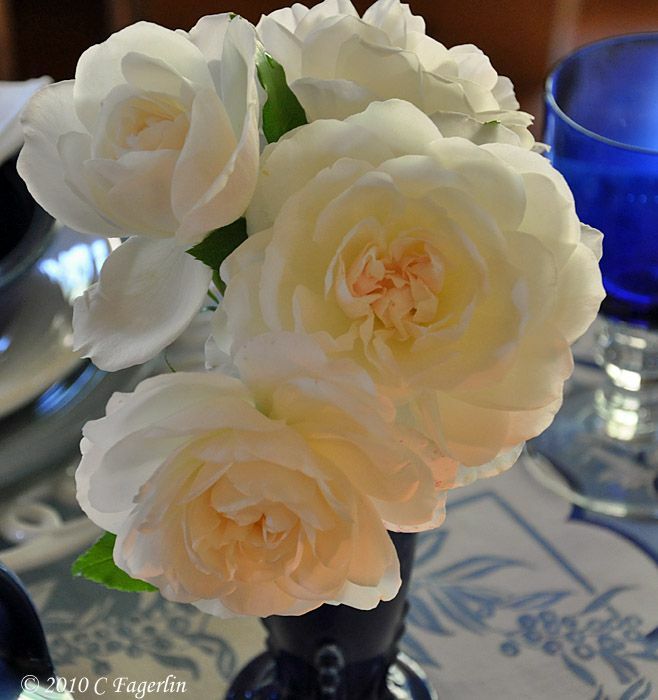 'Iceberg' roses from my garden picking up the candle light. 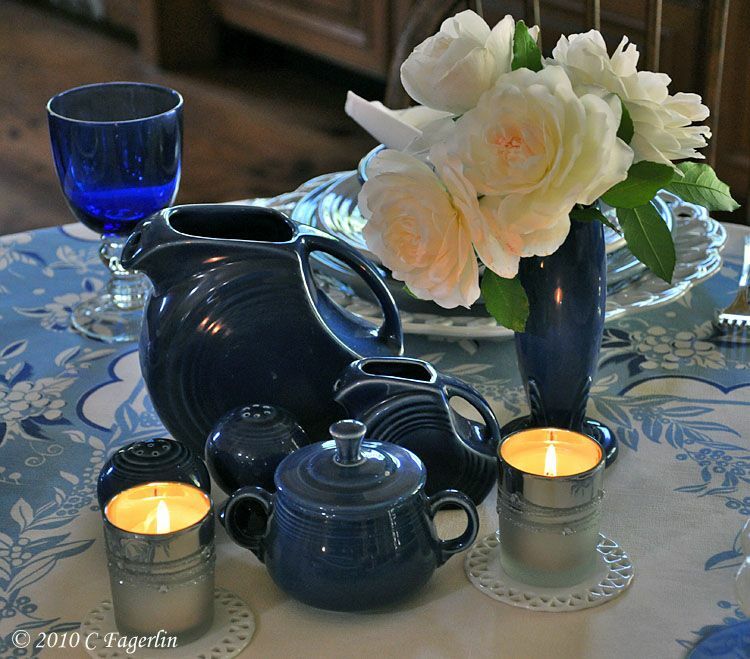 Sapphire juice pitcher , bud vase, S&P, mini disc pitcher and individual sugar bowl. Be sure to take time in your day to stop and smell the roses. They perfume your environment and enrich your soul. Thanks for coming by to see me today! 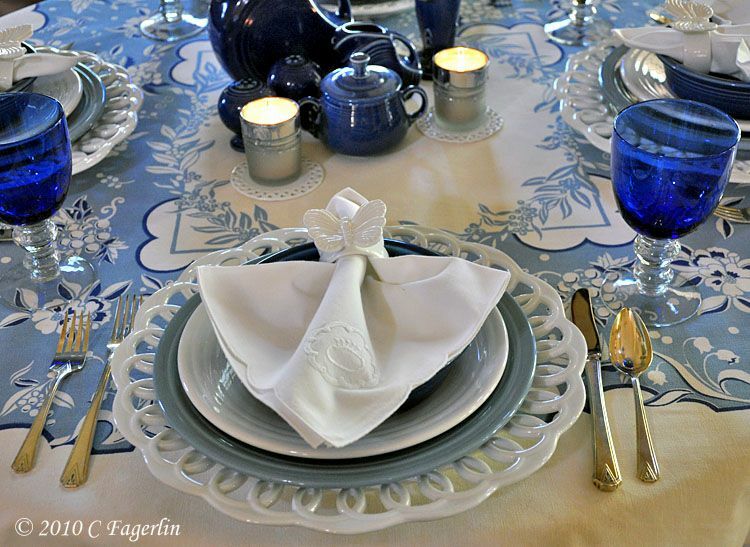 That vintage tablecloth is perfect. Love the blues with it. Looks clean and crisp! 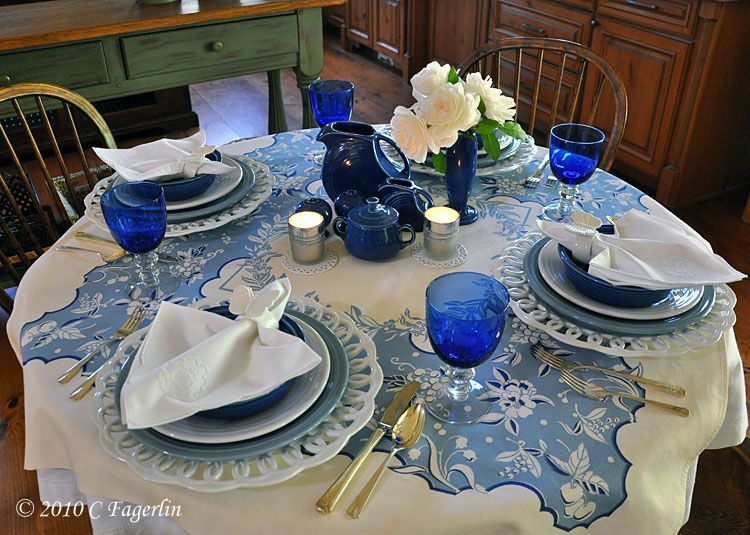 For a person without much Blue you sure put together one gorgeous table. I love the shades of blue and the white. Lovely! lovely set of blues!!! every photos are great...thanks for sharing, and happy Monday to you! you might like to visit my blog for a giveaway! Totally in love with the roses. And, the blue pitcher. I have one in yellow. Mine is a Fiesta, is yours? HOW bright & cheery! That tablecloth is amazing! I want to come over for dinner! That is absolutely delightful... I hope my guests don't ever go to your place first! Oh, Candy, what a beautiful table! Those roses must smell so lovely. Happy Blue Monday. Not much blue???!!!! Just gorgeous. Love your table. I can smell the roses! 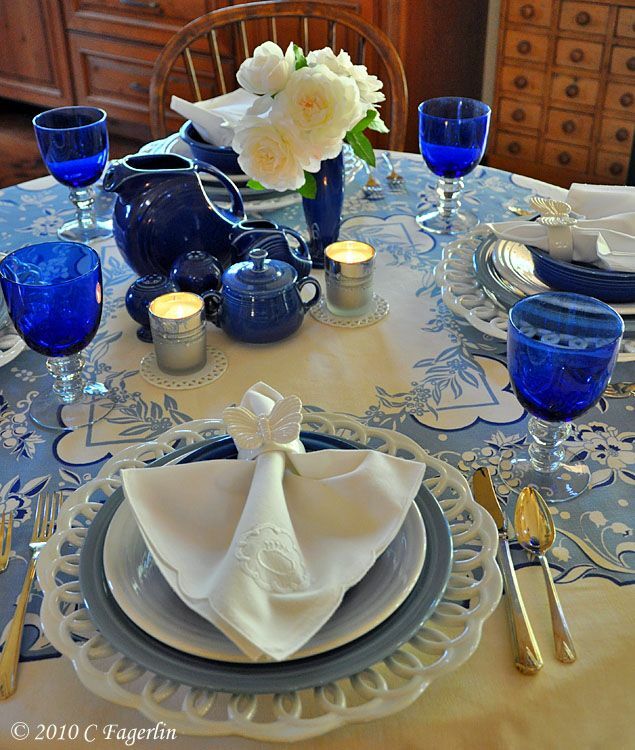 Candy, Your tablecloth is lovely and you have put together a beautiful table. Love your roses, too! 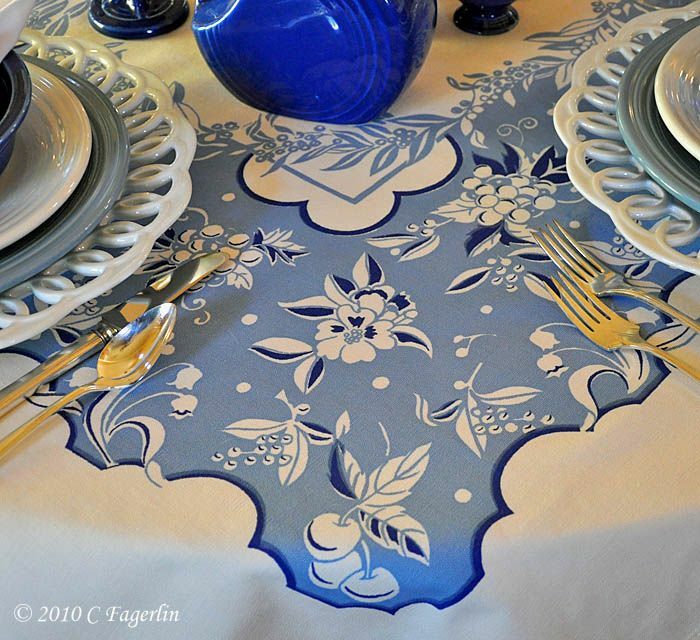 That vintage tablecloth is terrific - wish they were still making them like that! 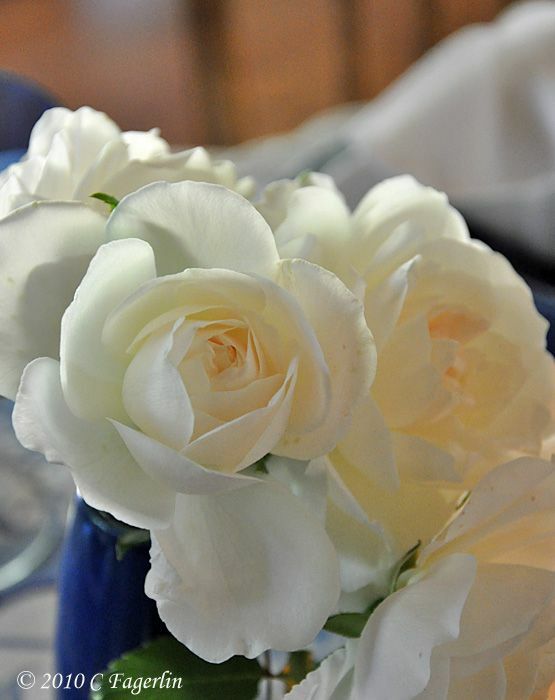 Every detail simply lovley!Your own picked roses are divine!! Your photos made me smile. Everything is just so beautiful and makes one happy just to look at. Wow so pretty stuff and my fav color blue. Happy blue Monday. Too gorgeous Candy! 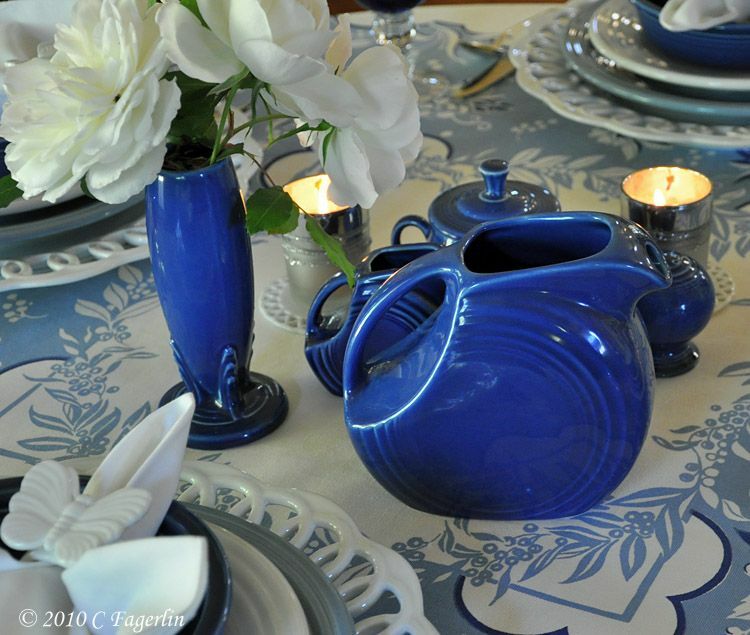 Love the blues-I could kick myself for not starting my Fiesta habit earlier! love it! 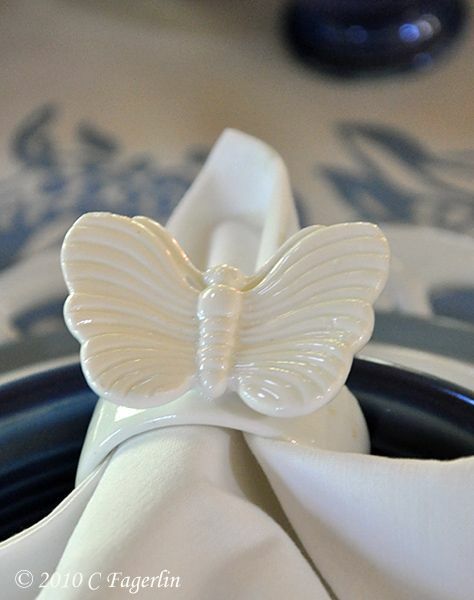 all of it are beautiful and elegant :) thanks for sharing! Love it! 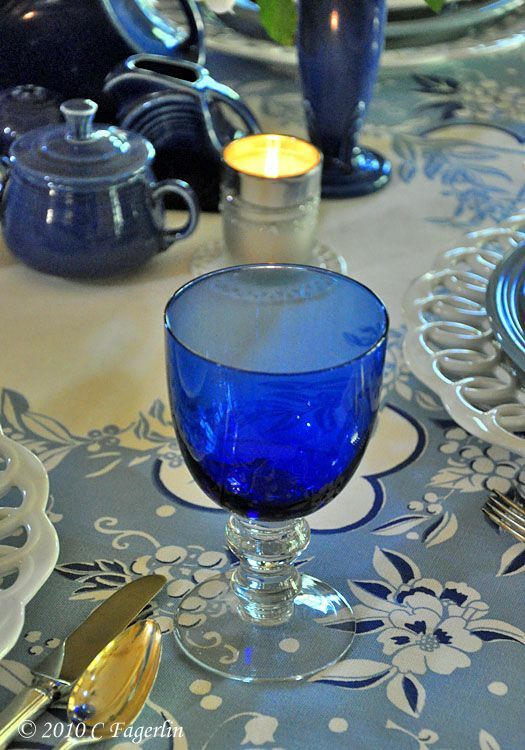 That tablecloth is really pretty and I love the cobalt blue stemware. Beautiful blue table and i love the closeups of the flowers. Thanks to all of you for your lovely comments on my BLUE contribution! It is really tough to find blue around here, must be that I had so much blue back in the 60's that I just rarely have anything blue now!